While going through the inventory of the Special Collections of Belk Library I came across a set of books that weren’t on the inventory list. The theme of the books spanned from race relations, social inequality, and other historic issues that have affected the United States. After asking for more information on the unlisted set of books I discovered that they belonged to William H. Maness Sr. ’38, an Elon alum who served as a vocal supporter of the civil rights movement. The more I went through his collection the more interested I became in the man who had been its owner. To further my inquiry, I studied several documents in Maness’s collection. One article entitled “Decisions-Decisions-Decisions (Or My Changing Mind)” caught my attention after I realized that Maness wrote it at the age of 89 years old. In it Maness recounts the decisions he made that had an enormous affect on life. He retells his reasoning for coming to Elon in 1934, becoming a Naval aviator in 1941 to fight in World War II, attending the Stetson School of Law, serving as a prosecuting attorney, and all the way to getting a divorce and getting remarried at age 70. Reading this article during my senior year has been a great incentive to think about how I will reflect on the decisions I make after leaving Elon. During his time as a prosecuting attorney, practicing lawyer, legislator and circuit judge for the Fourth Judicial Circuit in Jacksonville, Florida, Maness collected books, magazines and his journals to leverage his contentions for his approval of the Civil Rights Movement. 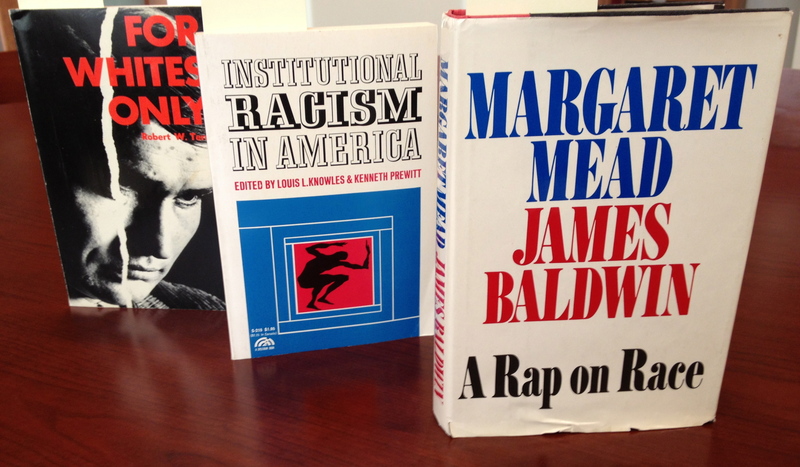 A few books in his collection include A Rap on Race by James Baldwin and Margaret Mead, Institutional Racism in America by Owen Blank, and For Whites Only by Robert B. Terry. There are also unpublished poems written by Mr. Maness on the subject of race in his printed materials. Two of my favorite poems written by Mr. Maness are entitled “Scared to Talk” and “Race”. After seeing the William H. Maness collection, there is no wonder he was voted the Distinguished Alumnus of the Year at Elon University in 1968. Students are welcomed and encouraged to view the books and personal papers of William H. Maness between 9am and 5pm in the Belk Library Archives throughout Black History month. Feel free to stop by and inquire further about the Maness collection or any of the blog posts during the month of February. This entry was posted in Alumni and tagged Black History Month, Civil Rights, Elon Alumni, William H. Maness. Bookmark the permalink.